Proprietary Name: Walgreens Instant Toothache And Gum Relief Triple Medicated What is the Proprietary Name? Non-Proprietary Name: Benzocaine, Menthol, Zinc Chloride What is the Non-Proprietary Name? 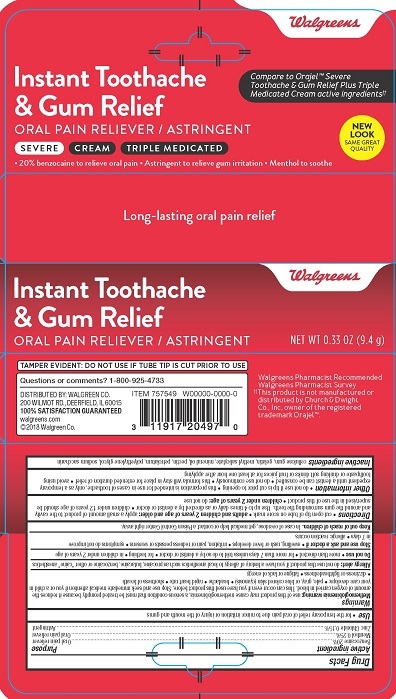 Walgreens Instant Toothache And Gum Relief Triple Medicated with NDC 0363-5350 is a a human over the counter drug product labeled by Walgreens. The generic name of Walgreens Instant Toothache And Gum Relief Triple Medicated is benzocaine, menthol, zinc chloride. The product's dosage form is cream and is administered via topical form. Directionscut open tip of tube on score markadults and children 2 years of age and older: apply a small amount of the product to the cavity and around the gum surrounding the teeth. Use up to 4 times daily or as directed by a dentist or doctor.